Since Bluebirds don't come to my bird feeders, I was happy to see this gorgeous fellow land in the Black Gum tree behind my house to look for insects on the ground! It is unusual for them to be so close to the house. I had seen a Sharp-shinned hawk land in a nearby tree a few minutes earlier, so I quickly changed lenses on my camera. Unfortunately, I wasn't quick enough, and it was gone by the time I got to the window. 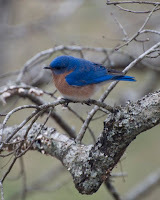 Just a few minutes later the bluebird came to visit! :) I put up 2 houses last fall, I hope the bluebirds will stake a claim! If not them, I'd be happy with Wrens too. We had a heavy, wet snowfall this morning that lasted for a couple of hours. I wanted to see what the snowflakes looked like and to t ry out my new easel for holding the velvet board. I had a hard time getting any photos because the snow would melt as I focused the camera. I managed to get one fairly good shot. 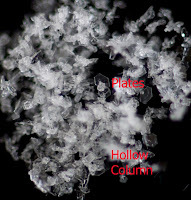 Most of the "flakes", which should actually be called "snow crystals", were flat, hexagonal plates. There were a few hollow columns mixed in. These are the types of crystals that develop in warmer temperatures (just below freezing) and lower humidity. Click on the snow photo to enlarge it. I have enjoyed learning about the different types of snowflakes and crystals this winter. That is one thing I will miss as the temperatures warm and we move into spring! Woodpecker War Update... I think the Red-bellied Woodpecker couple finally managed to win control of the nesting hole in the Silver Maple. I've been seeing the male coming to the tree today. I'm so glad the Starlings didn't get it! They are such obnoxious birds!